Recent advances in technology have expanded the use of endoscopy in the diagnosis and treatment of gastrointestinal conditions. The majority of endoscopic procedures are performed on the principle of air insufflating hollow organs. While perforation from increased intraluminal pressure is a known complication of endoscopy, pneumatosis from endoscopy is uncommon and has not been well recognized. Pneumatosis coli is the presence of gas or air dissecting the tissues in the wall of the large intestine. 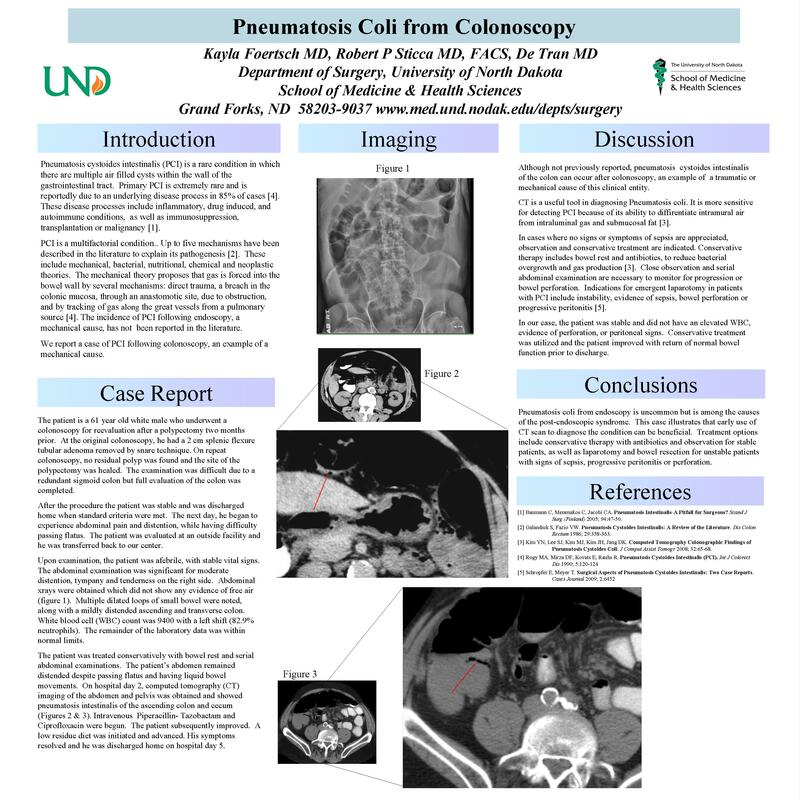 We report a case of pneumatosis coli from diagnostic colonoscopy. 61 y/o WM with a previously resected colonic polyp four months prior, underwent follow-up colonoscopy. The colonoscope was advanced to the ileocecal valve with some difficulty, due to a very redundant colon and significant amount of thick liquid stools in the cecum. The procedure was aborted and patient was discharged to home. Post-procedure, the patient developed abdominal pain, distention and was no longer passing flatus. He returned to the hospital. Physical exam revealed a distended and moderately tympanitic abdomen with positive bowel sounds. The patient was tender to palpation on the right. There was no rebound tenderness or guarding. WBC was within normal range. Upright abdominal X-ray did not reveal any free-air and mildly distended transverse colon. The patient was admitted for bowel rest, intravenous fluids, and observation. The patient continued to feel bloated and uncomfortable with no change on physical exam. His abdomen remainded moderatly distended. Post-procedure day 3, a CT scan abdomen and pelvis was performed and revealed pneumatosis coli in the junction of the ascending colon and cecum area with mild inflammatory change of fatty tissue stranding in the right lower abdomen. Prophylactic antibiotics were started and the patient’s condition improved. He began passing liquid stool and was less bloated. His diet was advanced and he was finally discharged on post-procedure day 5. Pneumatosis coli from endoscopy is uncommon but among the causes of post-endoscopic syndrome. This case illustrates that early use of CT scan to diagnose the condition for prompt treatment will result in fast recovery from this complication of endoscopy.